This activity will help children to model basic numbers and use counting and grouping strategies to demonstrate and verbalise relationships between basic numbers. In this case, the numbers 1-3. Using the well loved and well known tale of Goldilocks and The 3 Bears will help engage your child and also give them a greater understanding, meaning and depth. Incorporate Literacy in this activity and give it greater depth by first reading the story of Goldilocks and The 3 Bears. For this activity we read 2 different versions. How many Bears are there? Encourage one to one correspondence by pointing to each Bear as they count. How many bowls will you need? *Note: I provided more than 3 bowls so that counting and grouping was required. Make sure that each Bear has 1 bowl each and give these to the bears. She then matched 1 spoon for each bowl from a pile of spoons. This type of one to one correspondence and grouping is important for children to master and is often a starting point when teaching maths to young children. Encourage role play and letting them get involved in the game. Every focus of the activity does not have to be counting. Here she loved spending time working her hand-eye coordination to fill each of the bowls with "pom pom porridge"
To enhance the learning and add number recognition skills, I put a pile of our number cards* out on the table and had her find the card that matched the amount of bears. The number 3, represented in a variety of ways. Ways that make sense to children. Bed time for the 3 Bears. I provided a range of different sized boxes/plastic containers etc and various sized pieces of materials. Challenge your child to find and correspond the right sized container to make a bed for each bear. Use this time to talk about Small, Medium and Large. Introduce ordering by having your child place the bears in their beds in order from the smallest to the largest. 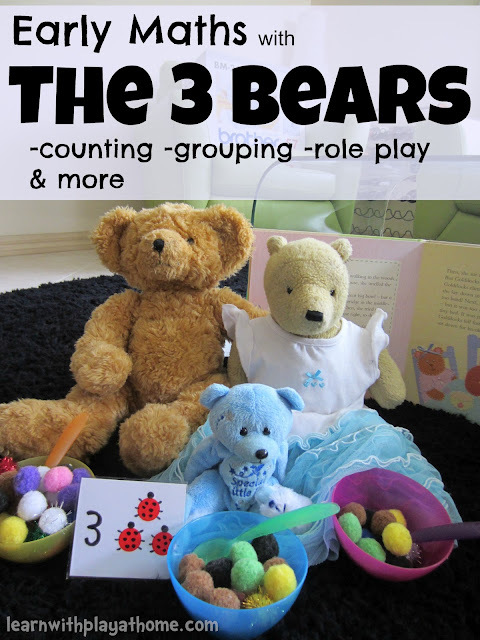 - Simplify this activity by encouraging the play and by assisting your child in counting out the props and corresponding them to each bear. Young children will have a ball simply going on the mission to find 3 bears. A daddy, a mummy and a baby bear. Start with this and play along together. You can also provide only 3 bowls/spoons etc and concentrate on the grouping and one to one correspondence of each item. ie. each bear gets one bowl and one spoon. - Further enhance this activity and add extra learning areas by having children act out the entire story. This type of role-play encourages memory, literacy skills, drama etc. - Use new language and descriptive words like, "bigger/larger," "smaller," "medium" etc This will help with their language development. -Ask questions to help connect their understanding and use vocabulary to give them words to describe what they're doing, eg. "Daddy Bear is so big! He needs a big bed. Can you find a big bed for Daddy Bear?" "Are there any beds that are larger than that one?" "How many blankets are you going to need?" - Listen to your child talk as they go through their experiences. This will help you determine where they are at with their learning, knowledge and understanding and help you to develop the activity (or future activities) to their level and interests. Directions: Write the numbers on squares of cardboard. Stick the corresponding amount of dot stickers on each card. For added fun, use a marker to add some simple little details. For added durability, laminate the squares. Hint: Make 2 sets of numbers so that you can play matching/memory games with the cards. Looking for more fun Real Life Math activities for kids? I love how you incorporated literature and role playing while learning numbers! I will be trying this out with my son soon! Oh now this looks like fun! Such a perfect example of how integrated play and learning is! This is just too cute and looks like fun! I'm gonnna try this with my students! Thanks for the inspiration! Debs, thank you so much for sharing this post. I can't tell you how many times we have role-played Goldilocks and the Three Bears with props, but not once have I thought about incorporating some maths concepts for my daughter. Tunnel vision- it's great to read about someone else's perspective. I love this Deb! have begun some early maths games with the twins and think they will find this one lots of fun! Thanks for sharing! The girls from AKBN are on FIRE this week. You are all posting activities that Miss Possum will love. I'm going to have a busy activity week! This one is awesome and may well be Miss Possum's fave. Thanks for linking up to The Children's Bookshelf. I love the various learning areas you've linked to this role-play. I haven't read that version of Goldilocks and the Three Bears. One of my favorite versions is the recent Me and You by Anthony Browne. Thanks for linking up to The Children's Bookshelf.